Rear Admiral Brian K. Antonio, Program Executive Officer, Littoral Combat Ships, visited the Bluefin Robotics Corporation facility in Quincy, MA on February 4th, 2016. As the milestone decision authority for the Knifefish Mine Counter Measure program, RDML Antonio toured Bluefin’s facility and received a detailed program brief from the Knifefish contractor team, including General Dynamics Mission Systems and Bluefin Robotics. RDML Antonio inspected all Knifefish hardware including three engineering development model Knifefish Unmanned Undersea Vehicles (UUV). RDML Antonio inspected all Knifefish hardware including three engineering development model Knifefish Unmanned Undersea Vehicles (UUV). 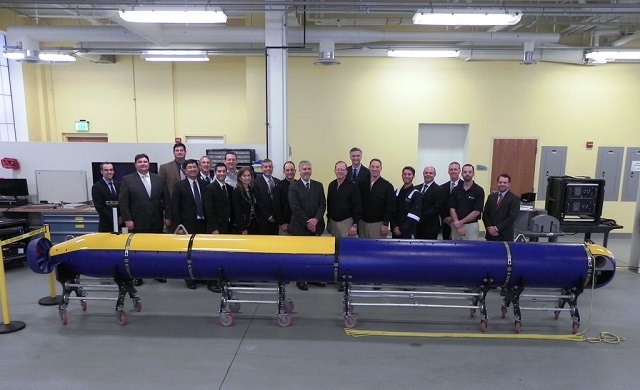 Several key subsystems were reviewed in detail, including a newly designed propulsion unit and subsea batteries that completed the first phase of stringent safety certification testing. To date, Knifefish UUVs have completed over 30 hours of at sea testing verifying the seaworthiness of the vehicle design. The ease of operating, servicing, and maintaining the Knifefish UUV and related mission support systems was witnessed during a working vehicle demonstration, highlighting the unique qualities of the vehicle’s modular, free flooding architecture. Additionally, the effectiveness and modularity of the Knifefish vehicle design to support multiple payload sensor variants was discussed by the Knifefish team. Program execution plans and milestones were reviewed and RDML Antonio reiterated the Navy’s commitment to the Knifefish system as an important solution to meeting a critical mine counter measure mission set.